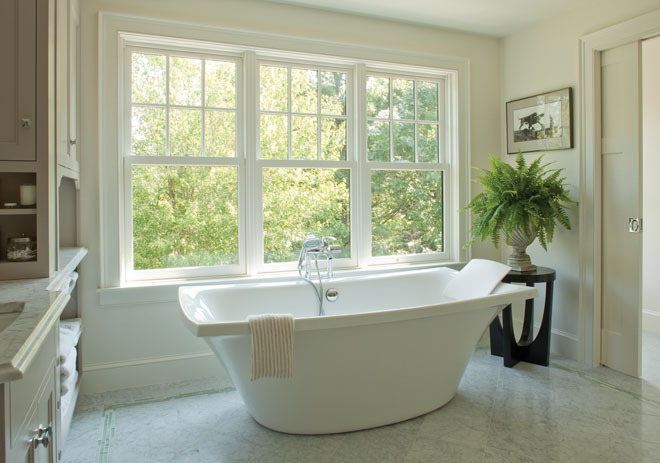 A modern tub in the master bath features distinctive molded corners that seem to melt towards the Carrara marble floor, which is bordered with alternating combinations of green and gray linear tiles in a random, sleek display. 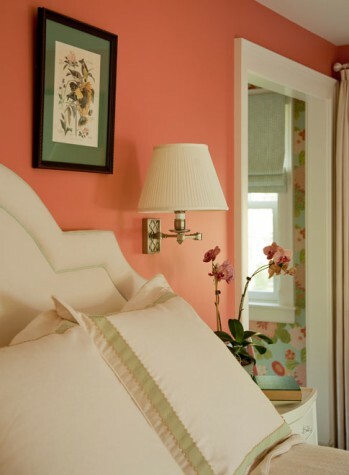 The mild-toned salmon pink walls of the master bedroom are complemented by a custom-designed scalloped headboard. 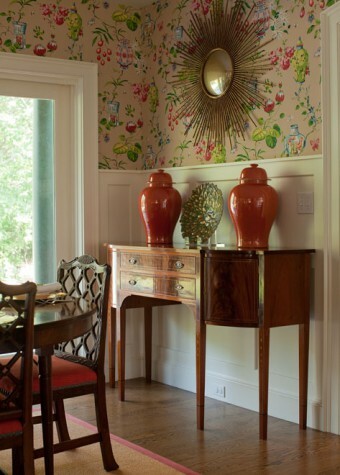 Tucked away beyond the master bedroom is a private sitting room with dahlia wallpaper in pinks, aquas, and greens. This tiny yet cheerful room houses select antiques, such as a sophisticated French settee covered in a red silk fabric with striped pillows bordered in a rainbow brush-fringe trim. Tom’s grandmother’s vanity table adorns a corner. In the living room an elegant white and cream palette provides a calm backdrop to the bolder blue accents of the painted bookshelf wall, geometric silk pillows, and fretwork coffee table. Flanking the fireplace are Louis IV French chairs recovered in a white Schumacher fabric with Oscar de la Renta’s Chevron Ribbon fabric applied to the outer panels. The accent pillows are a geometric cotton silk from the David Hicks Collection. Above the fireplace is the painting Great Spruce Head Island, Large Day by Brita Holmquist. As a transitional space between the barn and the rest of the house, the kitchen had to complement both the farmhouse style of the barn and the sophisticated design of the new main house structure. Leandra chose cabinetry with thick raised panels framed with custom beading. In the family room, Maine cottage furniture reflects a modern spin on traditional wicker design with sleek, sharp lines and nontraditional legs. The white barn walls provide a fresh backdrop to the vibrant salmon and aqua color scheme as seen in the large floral print on the wingback chairs, a lighter version of the blues and reds of the den and dining and living rooms. Accent pillows show off a geometric zigzag print framed by one-inch aqua tape. 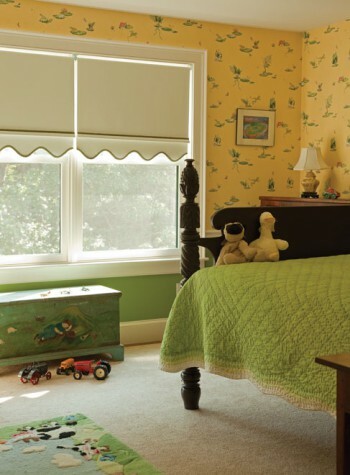 The room is the perfect play area for Leandra’s 7-year-old daughter, Harper. Interior designer and homeowner Leandra Fremont-Smith with her 4-year-old son, Tommy. 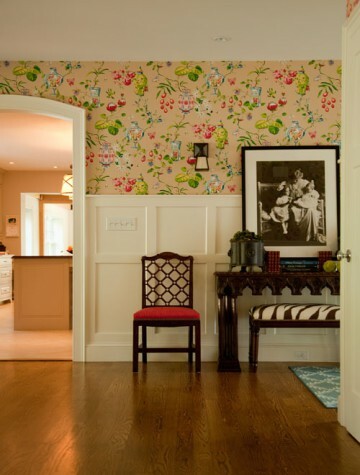 A formal entrance leads into a hallway of high, flat paneling with colorful chinoiserie wallpaper. The playful depiction of objects such as ginger jars and fishbowls sets a vibrant tone for the rest of the house. 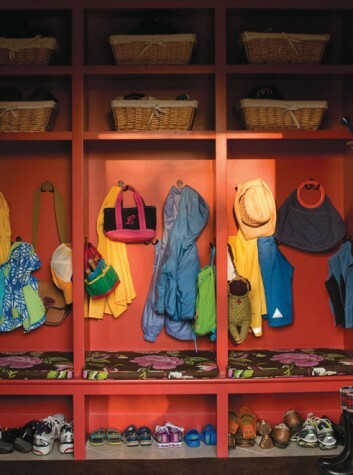 A mudroom features custom Shaker-style flat paneling, oil-rubbed bronze hardware, vibrant brick orange painted cabinetry, and contemporary floral print seat cushions. 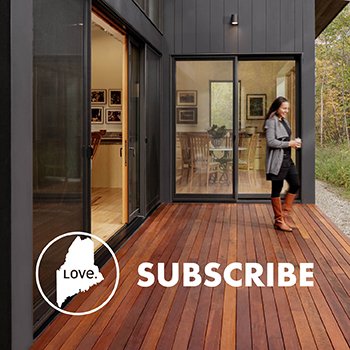 The home sits on the banks of the Cousins River and is a play on the Arts and Crafts movement in collaboration with the architectural influence of Fred L. Savage, a turn-of-the-century architect from Mount Desert Island, where Leandra and Tom spent their childhood summers. Interior designer Leandra Fremont-Smith creates a home for her most important clients yet: her family. I have quite a few carpenter and contractor friends whose talents I admire immensely (and, I’ll admit, envy moderately). You know the type: talented and crafty, always making beautiful things with their hands. When it comes to their own houses, I always expect a project in the works—a remodel here, a new piece of furniture there. But then I’m reminded. “Well, you know what they say,” they tell me, “the cobbler’s children have no shoes.” It’s counterintuitive that talented professionals in any given field would be the last to benefit from the same set of skills from which they earn their livelihood. But when paying clients call, personal pursuits can get moved to the bottom of the list. And so it often goes: the carpenter’s house lies in disrepair, the accountant is late to file his taxes, and the writer (including this one) doesn’t open her journal for months. When the couple first stumbled across five acres on the Cousins River in Yarmouth, they were thrilled about the site but lukewarm about the structures: a 1960s ranch and newer separate white clapboard barn that had been on the market for a long time. The ranch would need to be torn down, but the barn was in great condition and held potential. Leandra and Tom loved its farmhouse character and exposed beams. Eventually, a vision materialized, with the barn as the cornerstone of the design. 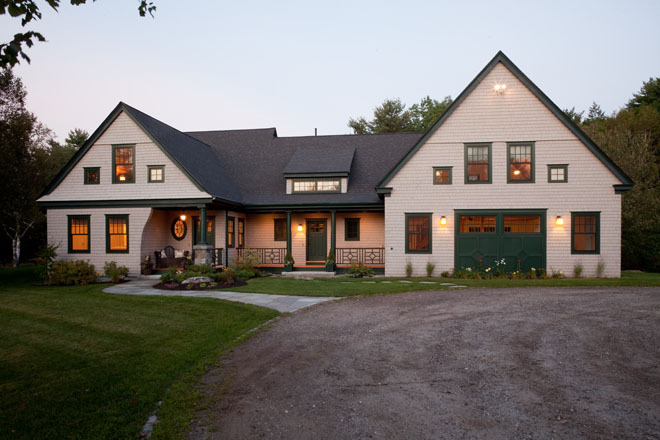 The couple worked closely with a design/build team led by John Rousseau of Rousseau Builders in Pownal to build a new house and seamlessly connect it to the barn. Leandra and Tom were on their way to creating their own take on the summer cottages they grew up in. When it came to things like cabinetry and woodworking designs, floor-plan layout, colors, lighting, flooring—an interior designer’s specialties—Leandra put on her designer hat and got to work. To make it official, she would schedule meetings with Tom at which she would present each scheme as if presenting to a traditional client. “Selling him on the front hall wallpaper was very important,” she recalls, “and I didn’t think he would approve. My backup schemes were not my favorites, and I will never forget showing him the first scheme and hearing him say, ‘Go for it. '” Soon Tom began to show a growing interest in Leandra’s design process—why she chose certain elements, and how they would evolve the character of each room. United by their shared love of Mount Desert Island and its beautiful architecture, the two found common ground more often than not. Of course, there were some memorable disagreements. When it came time to design the kitchen, for example, Tom wanted a center island that resembled a wooden tabletop, but Leandra preferred low-maintenance, durable Silestone. Leandra claims she won in the end (attributing it to her being 32 weeks pregnant at the time), but really they reached a happy compromise: Leandra had the Silestone fabricated in a mahogany hue with an S-shaped, ogee edge to make it feel more like a table and less like hard stone. As in all of Leandra’s projects, the kitchen is designed to function as the nucleus of the house—a place for gathering, entertaining, and of course, meal making and eating. In her own home, the kitchen would serve an additional purpose as a transitional space between the barn and the rest of the house. As such, it had to complement both the farmhouse style of the barn and the sophisticated design of the new structure, where the foyer, dining room, living room, den, and guestroom are located. Leandra chose cabinetry with thick raised panels framed with custom beading in a traditional style, while the stainless-steel appliances and polished nickel hardware establish a more contemporary vibe. 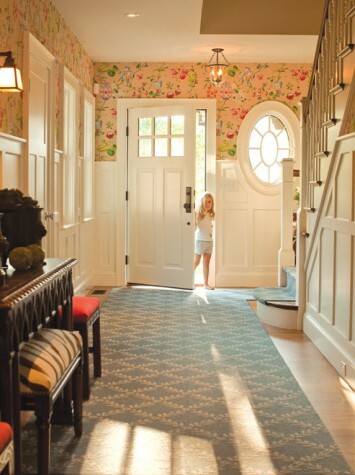 The best example of this can be found beyond the kitchen in the newer part of the home, where a formal entrance leads into a hallway of high, flat paneling with colorful chinoiserie wallpaper above. The wallpaper extends into the dining room, which can be seen from the adjacent living room and den, all of which are open to one another. The vibrant print features an expansive floral repeat and a playful depiction of objects such as ginger jars and fishbowls. “The high paneling along the wall serves as a foundation to ground the print, allowing for a bold, patterned choice without risking distraction,” explains Leandra. It’s here that it becomes evident why it was so critical for Leandra to convince Tom about this wallpaper: the entire scheme for the house was developed around it. Past the dining area and foyer and divided by two sets of columns, a sunken living room features five large windows set in a bow formation along the bend of the Cousins River. Leandra chose a color scheme of elegant whites and creams here, which serve as a calm backdrop to the bolder blues used as accents in the painting over the mantel, painted bookshelf back walls, geometric silk pillows, and fretwork coffee table. A large, contemporary, drum-shaped light fixture casts a dotted pattern on the ceiling, “a real hit when guests arrive,” according to Leandra. 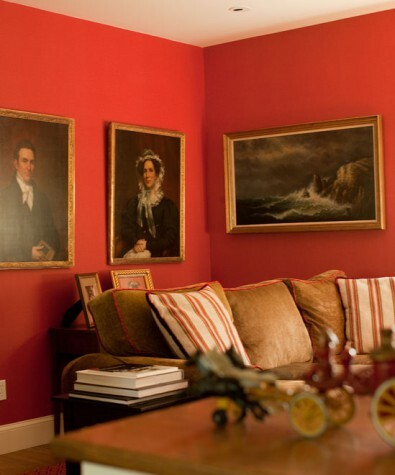 A small TV room off to the side makes a comfortable, warm nook with its rich red linen walls that display paintings and portraits from the family’s collection. Here, like everywhere in the home, the design is a tribute to her farmhouse memories from Mount Desert Island.